Premature Ventricular Complexes (PVCs), also known as Premature Ventricular Contractions, Ventricular Premature Beats (VPBs) or Ventricular Extrasystoles, are ectopic impulses originating from an area distal to the His Purkinje system. Premature ventricular complexes are the most common arrhythmia observed in patients without structural heart disease 1. PVCs are characterized by the premature occurrence of a wide QRS complex that is bizarre in shape. The wide QRS complex is accompanied by secondary ST segment and T wave changes and a full compensatory pause. Premature ventricular complexes reflect activation of the ventricles from a site below the AV node. Initiation of PVCs is dependent on the underlying condition and can be explained by reentry, enhanced automaticity or triggered activity. Enhanced automaticity suggests an ectopic focus of pacemaker cells in the ventricle. This process is the underlying mechanism for arrhythmias due to catecholamines or hyperkalemia. Reentry occurs in patients with underlying heart disease due to myocardial scarring or ischemia. It can produce single ectopic beats, or it can trigger paroxysmal tachycardia. PVCs caused by triggered activity are often seen in patients with ventricular arrhythmias due to digoxin toxicity and reperfusion therapy after Acute Myocardial Infarction. The mechanism of PVCs in patients without structural heart disease is thought to be enhanced automaticity versus triggered activity. The ectopic impulses on the electrocardiogram are premature in relation to the expected impulse of the basic rhythm. The QRS complex is abnormal in duration and morphology. It is accompanied by secondary ST segment and T wave changes. The morphology of the complexes may vary in the same patient. There is usually a full compensatory pause following the Premature ventricular complexes. Retrograde capture of the atria may or may not occur 2. When the major QRS deflection is upright, the ST segment is depressed and the T wave inverted. When the major QRS deflection is negative, the ST segment is elevated and the T wave upright 2. 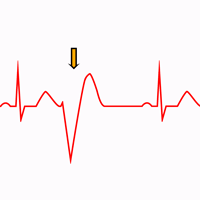 Premature ventricular complexes are typically followed by a compensatory pause. That means that the cycle length after the PVC is longer than the basic cycle. If the basic rhythm is sinus in origin, there is usually a full compensatory pause, the sum of the RR intervals that precede and follow the ectopic complex is equal to the sum of two RR intervals of the sinus rhythm. The full compensatory pause occurs because the sinus rhythmicity is undisturbed by the ectopic impulse (unlike with premature atrial complexes). The frequency of the ectopic beats varies widely not only among individuals, but also in the same subject at different periods of observation. Multifocal: Arising from two or more ectopic foci; multiple QRS morphologies. Frequent: 10 or more PVCs per hour (by Holter monitoring) or 6 or more per minute. Occasional: Fewer than 10 PVCs per hour or fewer than 5 per minute. Bigeminy: Paired complexes, PVC alternating with a normal beat. Trigeminy: PVC occurring every third beat (two sinus beats followed by a PVC). Quadrigeminy: PVC occurring every fourth beat (PVC following three normal beats). The QRS morphology on EKG can predict the PVCs site of origin. As a broad general rule, the right ventricular ectopic pacemaker generates a ventricular complex with Left Bundle Branch Block (LBBB) pattern, and the left ventricular ectopic pacemaker generates a ventricular complex with Right Bundle Branch Block (RBBB) pattern 2. The right or left ventricular outflow tracts and aortic cusp are the most common sites of origin for PVC in the absence of structural heart disease. Right ventricle outflow tract (RVOT): Left Bundle Branch Block pattern and inferior frontal plane axis with tall positive R waves in inferior leads. PVCs with Left Bundle Branch Block pattern and tall positive R waves in inferior leads. Aortic Cusp: Left Bundle Branch Block pattern and inferior frontal plane axis but with early precordial R transition in V2 and V3. Left ventricle outflow tract (LVOT): Right Bundle Branch Block pattern and inferior frontal plane axis. PVCs originating from epicardial sites have a pseudo-delta wave, with slurring of the initial part of the QRS complex and delayed intrinsicoid deflection in the precordial leads 3. Fascicular PVCs: RBBB morphology with either an anterior or posterior hemiblock pattern. Fascicular PVCs have a relatively narrow QRS 3 4. An interpolated Premature Ventricular Complex is sandwiched between two consecutive sinus complexes without disturbing the sinus rhythm. It occurs mostly when the sinus rate is slow and the PVC is early. Fusion beats or fusion complexes occur when a supraventricular impulse reaches the ventricles during a ventricular beat and they coincide to produce a hybrid complex. The morphology and duration of fusion beats are usually intermediate between the morphologies and durations of two QRS complexes. The R-on-T phenomenon describes ventricular depolarization which is superimposed on the T wave of the preceding beat. Early observations suggested that R-on-T was likely to initiate sustained ventricular tachyarrhythmias. Long QT intervals predispose the patient to an R-on-T phenomenon, which can initiate a episodes of Torsades de Pointes. PVC with very short coupling interval (R-on-T phenomenon) can trigger polymorphic ventricular tachycardia in the hyperacute phase of Acute Myocardial Infarction 5. Frequent PVCs (>15%) may produce a reversible form of left ventricular dysfunction 6. However, it is sometimes difficult to ascertain whether the PVCs caused left ventricular dysfunction or whether progressive left ventricular dysfunction caused frequent PVCs 6. Assessment and treatment of PVCs is challenging and complex, and is highly dependent on the clinical context. The prognostic significance of PVCs is variable and, again, best interpreted in the context of the underlying cardiac condition. Available treatments include medical suppression and catheter ablation. Beta-blockers are the mainstay of medical suppression of PVCs. Verapamil and Diltiazem are highly effective in treating fascicular PVCs. Amiodarone is very effective in suppressing PVCs but has considerable short-term and long-term side effects. Radiofrequency ablation provides a definite therapy for symptomatic PVCs. In addition to an excellent safety profile, ablation has been associated with reversal of ventricular dysfunction, but is typically reserved for drug-intolerant or medically refractory patients with a high PVC burden 4. According to the 2017 AHA/ACC/HRS Guideline, PVC ablation is reasonable (Class I) for symptomatic PVCs or declining ventricular function suspected to be due to frequent PVCs, when drug therapy is ineffective, not tolerated, or not preferred by the patient. PVCs ablation may also be considered (Class IIb) to treat or prevent fascicular system PVCs that reproducibly induce ventricular fibrillation 7. 7. Priori SG, Blomström-Lundqvist C, Mazzanti A. 2015 ESC Guidelines for the management of patients with ventricular arrhythmias and the prevention of sudden cardiac death. European Heart Journal. 2015; 36: 2793–2867.